Bad attitude earns the big bucks. Costa Rica 3 413, originally uploaded by Mic2006. 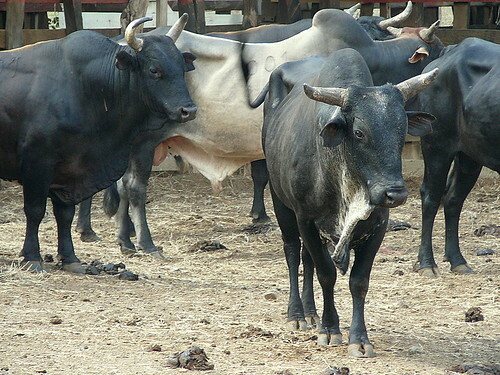 These are the bulls – the most ferocious in Central America. Guanacaste is famous for its bulls and these are the cream of the crop – killers every one of them. Guanacaste is especially well suited to raising cattle as its interior consists of vast dry plains – the only shade being the umbrella expanse of the Guanacaste tree. The humped cattle or Zebu are more tolerant to heat and have far more sweat glands. Their oily skin helps shed parasites and ticks. The famous Brahman is a sub species of the Zebu along with other species such as the Gir, Afrikaner and the Indo Brazilian. To my untrained eye the above appear to be Brahman – first domesticated in India some 10 000 years ago but the cattle most commonly seen in Costa Rica are the Indo Brazillian. They have great hanging dewlaps and absurdly floppy ears. Terrible meat and I would not reccomend them to anyone. Up until this day, it had only threatened rain – brief sprinklings from a leaden blanket above – lilac flashes in the dry and dusty hills around Tamarindo but today it was different – the sky leaked water as though its belly had been slit – an evisceration that began with a splattering of large warm drops upon the beach soon escalating to a all out downpour the like of which we had never seen. The Costa Rican weather can be stupendous. Leaving the beach at the initial onset we headed for the tour company – hoping to find our trip to Barra Honda being arranged as promised, but the intensity of the rainfall had us seeking shelter in “The Pelican Bar”. The bar had sucked up all street traffic for some 50 metres circumference. In dripping darkness without power as frequently seemed to be the case- was packed a great many people from the street – cheek to jowl – sweating and waiting. Few were paying customers. 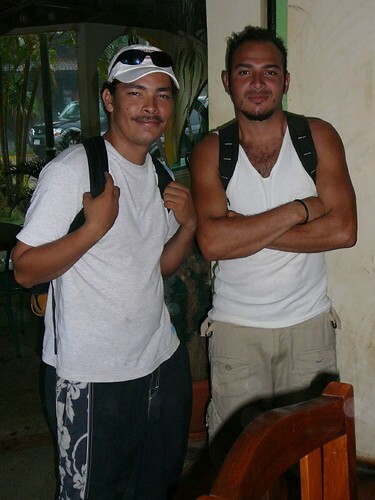 These two fellows in the picture are Carlos from Tamarindo and the other (whose name I cant remember – but who came from Managua – Nicaragua) I recognized Carlos from the beach, he sold cheap porclean pots with Mayan symbols. I cant imagine how they made any money as I never saw anyone buying them. Every time the thunder struck Carlos cowered and grimaced – gun shy by all apearance – like a war veteran – but Costa Rica is peaceful so maybe a childhood fear. I bought them beer – the cost of which likely would exceed their daily earnings but they were friendly decent people and by the time the rain subsided and the air had cooled we were pretty tipsy. “KEY – AERO” Spanish for “I would like”.